Indoor or outdoor applications. To support EMT conduit. Indoor or outdoor applications. To support EMT conduit. Indoor or outdoor applications. Use to secure PVC conduit to wood, masonry or similar surface. Bulk packed. Indoor or outdoor applications. Use to secure PVC conduit to wood, masonry or similar surface. Bulk packed. To support EMT conduit where greater load bearing is required. Indoor or outdoor applications. Use to secure and suspend conduit from overhead supports. Comes with a nut and bolt. Indoor or outdoor applications. Use to secure PVC conduit to wood, masonry or similar surface. Bulk packed. Indoor or outdoor applications. Use to secure PVC conduit to wood, masonry or similar surface. Bulk packed. Use to secure and suspend conduit from overhead supports. Comes with a nut and bolt. Indoor or outdoor applications. To support EMT conduit. Safe, non-conductive. To be used in accordance with NEC, Article 347.8 conduit spacing requirements. For use with Schedule 40/80 non-metallic solvent weld fittings. Safe, non-conductive. To be used in accordance with NEC, Article 347.8 conduit spacing requirements. For use with Schedule 40/80 non-metallic solvent weld fittings. To support EMT conduit where greater load bearing is required. Indoor or outdoor applications. Indoor or outdoor applications. Use to secure PVC conduit to wood, masonry or similar surface. Bulk packed. Use to secure and suspend conduit from overhead supports. Comes with a nut and bolt. Indoor or outdoor applications. Use to secure Rigid or I.M.C. conduit to wood, masonry or similar surfaces. 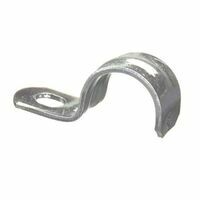 Halex One-Hole Strap, 1 in Nominal, Steel, Zinc Electro Plated, 7/8 in Width, CSA Certified, UL Listed, For Indoor/Outdoor Applications Indoor or outdoor use. Use to secure Rigid or IMC conduit to wood, masonry or similar surfaces where greater load bearing is required. UL Listed, CSA Approved. Indoor or outdoor applications. Use to secure PVC conduit to wood, masonry or similar surface. Bulk packed. Use to secure and suspend conduit from overhead supports. Comes with a nut and bolt. Use to secure and suspend conduit from overhead supports. Comes with a nut and bolt. Use to secure conduit to a metal beam. Clamps on beam, girder or similar structure to provide a mounting base for attachment of a conduit hanger, either directly or by means of a threaded rod. Eliminates need to drill hole through beam. Offers same chemical resistance as Carlon nonmetallic conduit for a complete, corrosion resistant system. UV resistant for use in direct sunlight. Use in accordance with conduit spacing requirements per NEC. Each clamp requires 2 screws, 2 nuts, and 2 washers. Gray clamps for standard conduit. To support EMT conduit where greater load bearing is required. Indoor or outdoor applications. Indoor or outdoor use. Use to secure Rigid or IMC conduit to wood, masonry or similar surfaces where greater load bearing is required. UL Listed, CSA Approved. Indoor or outdoor use. Use to secure Rigid or IMC conduit to wood, masonry or similar surfaces where greater load bearing is required. UL Listed, CSA Approved. Indoor or outdoor applications. To support EMT conduit. Offers same chemical resistance as Carlon nonmetallic conduit for a complete, corrosion resistant system. UV resistant for use in direct sunlight. Use in accordance with conduit spacing requirements per NEC. Each clamp requires 2 screws, 2 nuts, and 2 washers. Gray clamps for standard conduit. Use to secure and suspend conduit from overhead supports. Comes with a nut and bolt. Indoor or outdoor applications. To support EMT conduit.